Two new tenders in the island of Evia are coming soon, according to the Ministry of Public Works. The Greek Ministry of Public Works has announced that two new tenders will be held on 23rd of February and 1st of March 2016. The Island of Evia is very often suffering from rockfall problems. 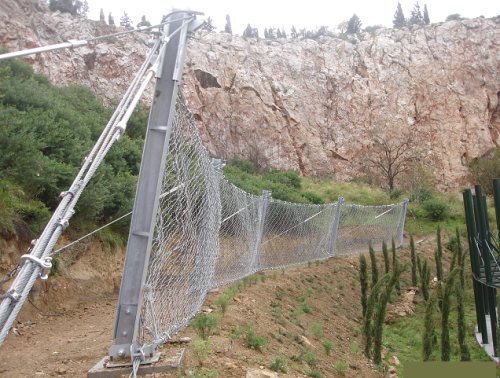 Maccaferri Hellas is in constant contact with the Authorities and contractors, in order first of all to offer its expertise and experience in rockfall protection, but also to meet effective and safe solutions for the protection and rehabilitation from natural hazards. Another tender has been recently held and Maccaferri participated inherently soil stabilization solutions. These two tenders have already attracted the interest of many contractors and the participation is going to be big. Maccaferri Hellas is already in constant communication with them by providing relevant information about the products, the installation the specifications and most of all its experience from relevant projects etc. Both the tenders describe a variety of products, which includes rockfall barriers, simple and secured drapery applications products such as Steelgrid MO, Steelgrid BO or Steelgrid HR. Steelgrid is a geocomposite of double twisted steel wire hexagonal mesh and high tensile strength steel cables, woven together during the manufacturing process to form a high strength mesh for rockfall simple drapery and surface stabilization applications. Concerning the described barriers, these are capable of withstanding the impact of a rock block with energy levels in excess of 500 Kj , 1000 Kj and 2000 Kj. The barriers height is variable between 3 m, 4 m and 5 m depends on the energy level of each barrier. We have the relevant know-how and the expertise to help the designers and the contractors by providing them with not only tailor made solutions for their project but also with cost effective and environmentally friendly results. To learn more about our rockfall protection solutions, please contact us now.